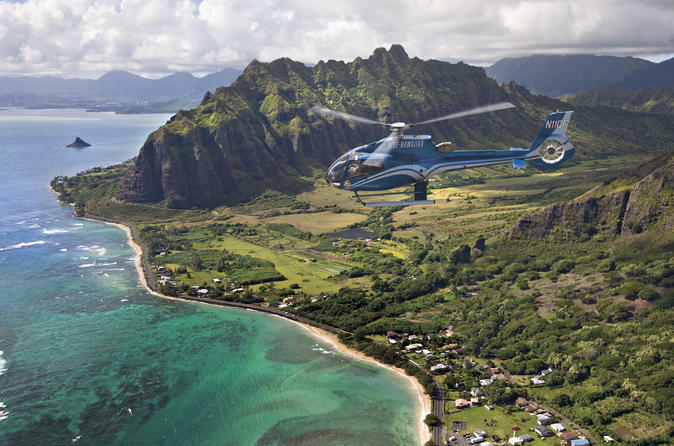 A 30 minute helicopter tour departing from Honolulu Airport. Departing from Honolulu Airport, this 30 minute tour highlights the best of Oahu's past and present along the gold coast of the island. A string-of-pearls full of stunning sights: Picturesque Honolulu Harbor, graced by the renowned Aloha Tower; downtown Honolulu and Iolani Palace, the only royal palace in America; heart-tugging Punchbowl, the National Memorial Cemetery of the Pacific; Magic Island, Ala Moana Beach Park, the legendary vistas of Waikiki Beach and Diamond Head, and the unforgettable emotion of Pearl Harbor and the Arizona Memorial. For guests staying in the Waikiki area, complimentary shuttle service is available and can be arranged with reservations after confirming your booking.